Craters of the Moon National Monument, the alien landscape is situated in the Snake River Plain, about 145 km (90 mi) north east of Twin Falls. Where in the United States is Idaho? Location map of Idaho in the US. Idaho is a landlocked mountainous state in the Pacific Northwest region of the United States. It shares a short border (72 km (44.7 mi) at 45th parallel north) with the Canadian province of British Columbia in north. The ridges of the Bitterroot Range define its border with Montana. It also borders the U.S. states of Wyoming in south east, Nevada and Utah in the south; and Washington and Oregon in the west. Idaho is subdivided into 44 counties. The United States acquired the area of Idaho through a treaty with Great Britain in 1846. Idaho Territory was organized from parts of Dakota, Nebraska, and Washington territories on 3rd March 1863, and included parts of present-day Montana and Wyoming. When Idaho became a territory, there were four counties in existence: Boise, Idaho, Nez Perce and Shoshone. Idaho was part of Oregon Country, it was explored by Lewis and Clark in 1805 and was crossed by the Oregon Trail that ended at Fort Vancouver in Washington. 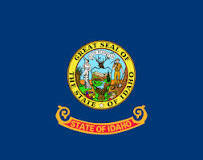 Idaho joined the Union at 3rd July 1890 as the 43rd state. 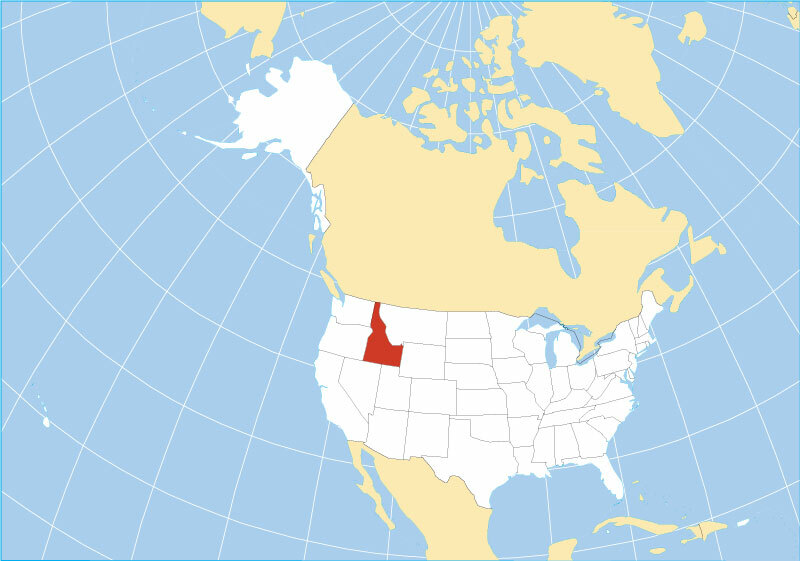 Idaho covers an area of 216,632 km² (83,570 sq mi)  the "Gem State" (its nickname) is somewhat smaller than the island of Great Britain (229,848 km²) or about half the size of Iraq (438,317 km²). Idaho is about the size of Utah, but would fit into Texas more than 3 times. Rivers, mountains, and farmland dominate Idaho's landscape, which includes a portion of the Rocky Mountains. 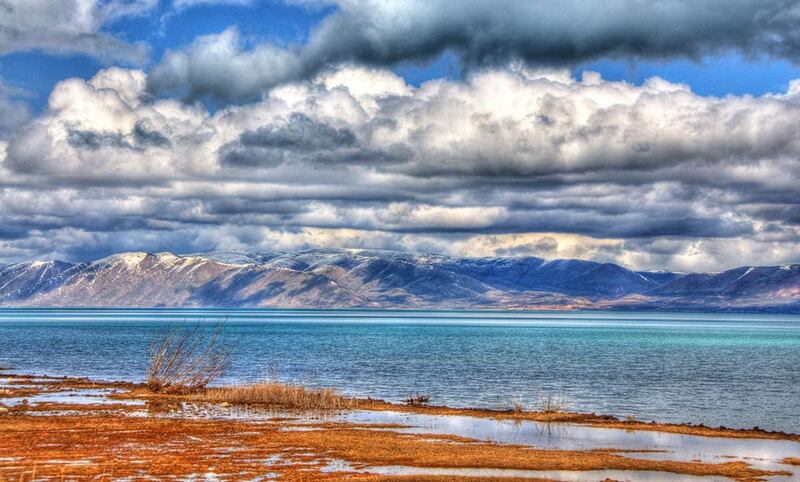 Bear lake on the Utah-Idaho border, it is one of the oldest lakes in North America. The unique aquamarine color of its waters are the reflection of calcium carbonate (limestone) deposits suspended in the lake. The Bitterroot Range, a subrange of the Rockies, runs along the Idaho-Montana border. The Salmon River Mountains and the Smokey Mountains, both part of the Rocky Mountains, are covering most of the central region of the state. Idaho's highest point is Borah Peak at 3,859 m (12,662 ft), located in the Lost River Range, another subrange of the Rockies. The deepest gorge in North America is located along the border of eastern Oregon, eastern Washington and western Idaho. The canyon is part of the Hells Canyon National Recreation Area and is North America's deepest river gorge at 2,436 m (7,993 ft). The canyon was created by the Snake River, which flows more than 1.600 m (1 mi) below the canyon's west rim, and 2,300 m (7,400 ft) below the peaks of Idaho's Seven Devils Mountains range to the east. Checkerboard pattern alongside the Priest River in northern Idaho. 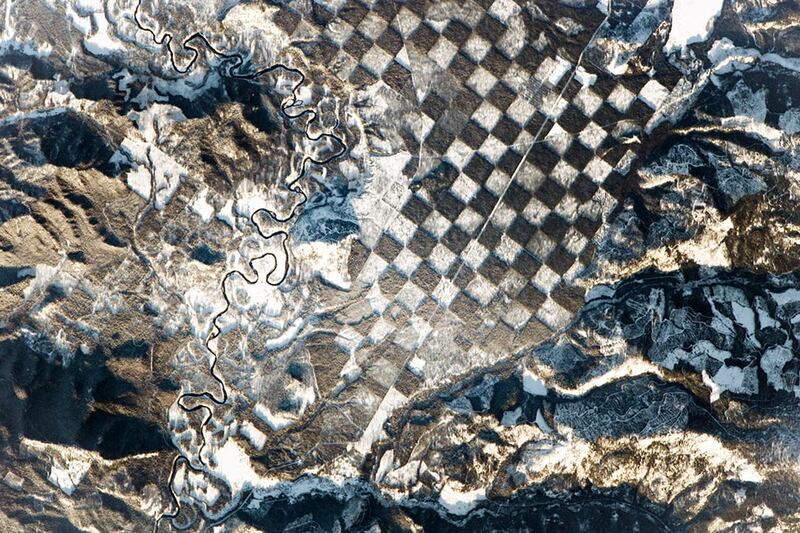 The squares in this landscape checkerboard appear to be the result of forest management. 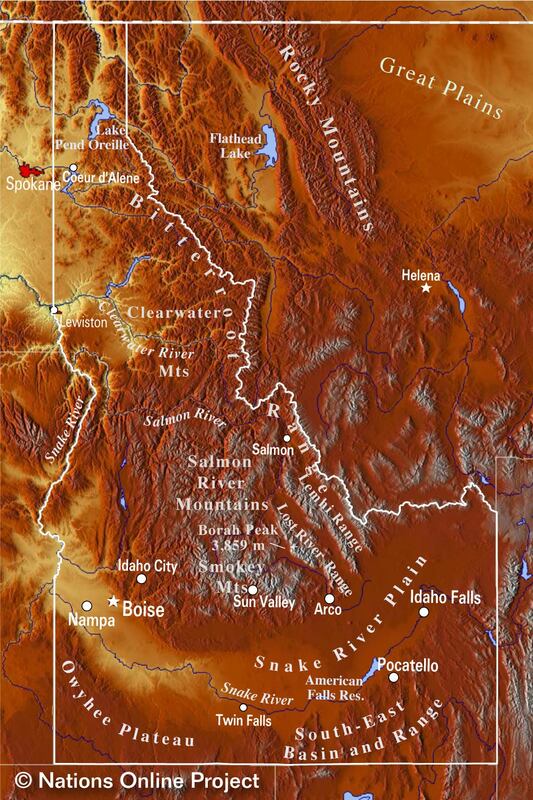 In the southern part the Snake River Plain dominates Idaho's landscape, the flat, arc-shaped depression covers about a quarter of the state, on its course through the plain, the Snake River has created many canyons and gorges. Within the Snake River Plain is the Craters of the Moon National Monument, a vast flood basalt area with scattered islands of cinder cones and sagebrush midway between Boise and the Yellowstone National Park. The three major lava fields are the result of volcanic eruptions between 15,000 and 2,000 years ago. Famous Yellowstone National Park is mostly in Wyoming, but the park spreads also into parts of Montana (3%) and Idaho (1%). The park is since 1978 a UNESCO World Heritage Site. Rendered image of Idaho State Capitol building in Boise, the neoclassical 1914 statehouse is home to the government of the state of Idaho. 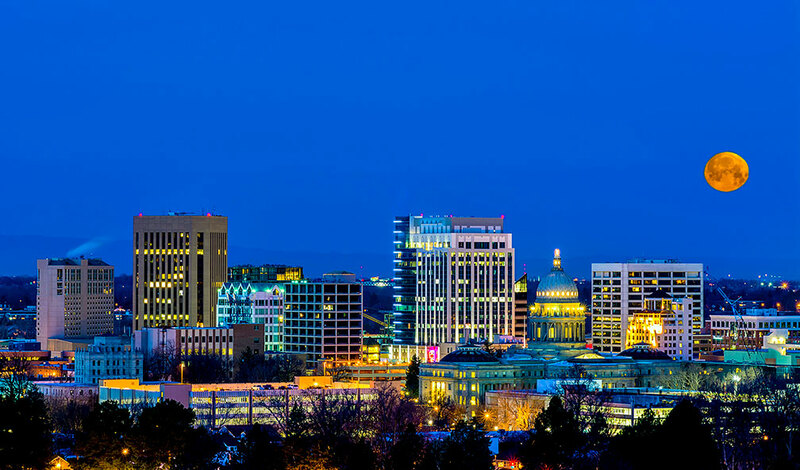 Largest city and capital is Boise, largest metro is Boise metropolitan area (Boise City–Nampa, Idaho Metropolitan Statistical Area), also known as the 'Treasure Valley'. Other major cities are Meridian, Napa, Idaho Falls, Pocatello, and Caldwell. Blue night sky over Boise Idaho. 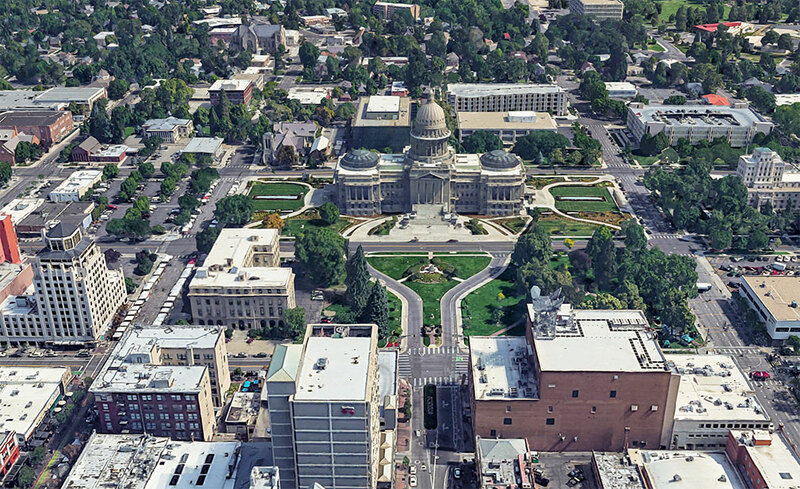 Boise is the capital and most populous city of Idaho, and the county seat of Ada County. Cities with a population of more than 50,000: Napa, Meridian, Idaho Falls, and Pocatello. American Falls, Arco, Blackfoot, Bonners Ferry, Burley, Caldwell, Cascade, Challis, Chubbuck, Coeur d'Alene, Downey, Dubois, Gooding, Grangeville, Hailey, Idaho City, Kellogg, Ketchum, Lewiston, Malad City, Mc Call, Montpelier, Moscow, Mountain Home, New Meadows, Orofino, Payette, Rexburg, Rupert, Salmon, Sandpoint, Shoshone, Soda Springs, St. Anthony, St. Maries, Sun Valley, Twin Falls, Wallace, and Weiser. 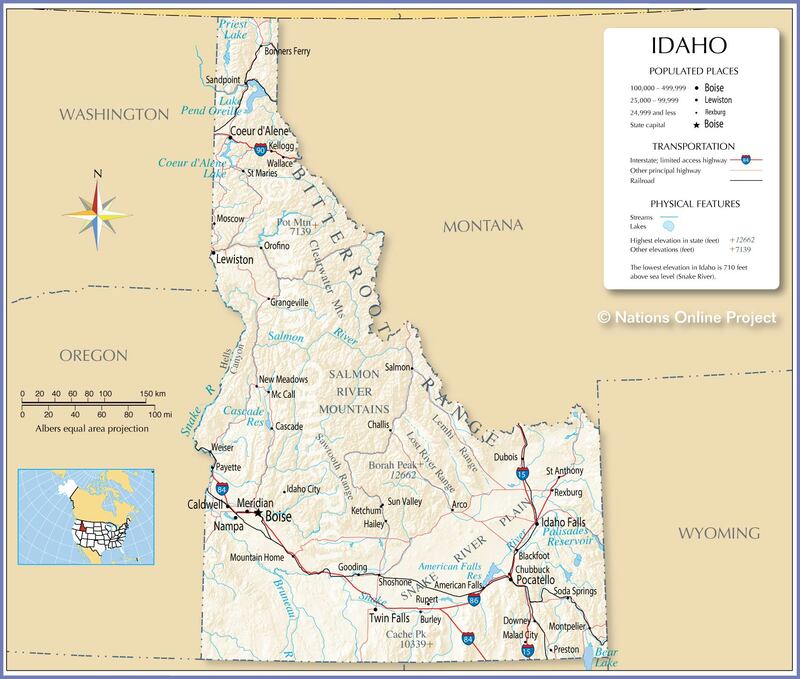 The detailed map below is showing the US state of Idaho with boundaries, the location of the state capital Boise, major cities and populated places, rivers and lakes, interstate highways, principal highways, and railroads. You are free to use this map for educational purposes (fair use), please refer to the Nations Online Project. Map is based on a state map of The National Atlas of the USA. Reference Map of Mainland USA. Searchable map/satellite view of the United States.